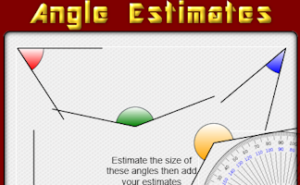 There’s a protractor you can drag over the angles to measure them. Hold down the shift key while dragging to rotate the protractor. The previous Flash version of this activity is here. This may be useful if you have an older web browser that does not support rotating the protractor.